It's easy to feel hopeless about climate change. The weather gets crazier with each passing decade and in the meantime it seems like society is hardly doing anything at remotely the relevant scale. Americans refuse to conserve very much, and the Chinese and Indians are burning coal at an ever more rapid pace. That looks terrible right? Those two lines at the bottom are negligibly different from zero on the scale of our total energy consumption - that blue line, which continues to head inexorably upward after the briefest of interruptions for the great recession. But that isn't the full picture. What it conceals is that the growth rates are completely different. Over the last ten years of data (all from BP by the way), the average growth rate in primary energy consumption is 2.7%. Meanwhile, the wind energy grew at 25% and the solar energy grew at 44%. And this makes all the difference! Those are incredibly high growth rates and mean that the awe-inspiring power of exponential growth is on our side. 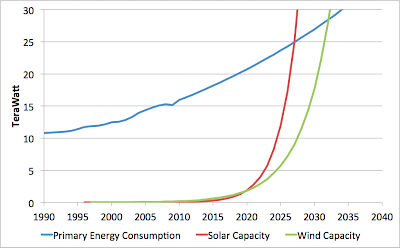 We spend the next decade with the graph still looking pretty bad, but then the power of exponential growth starts to really show, particularly in the solar line, and we see that the renewables would get to the scale of the entire planet's energy use sometime in the ballpark of 2030. So to look at the situation now and say that it's hopeless is like looking at an acorn growing its first handful of leaves and declaring that the little sapling is hopeless and that this will never amount to an oak tree. An ecotechnic world - one in which we drive around in electric cars, and heat our houses and offices with heat pumps, and fly around on biofuels, and power the whole thing from the sun and the wind, is doable. But it's in its infancy. It's the acorn, not the tree already. And that being the case, the most important thing by far is that we shelter that acorn: keep it watered, shade it if the sun gets too strong, give it steady doses of fertilizer. It's the growth rates in solar and wind energy that are the critical things to watch. As long as those are high, the situation is not hopeless, regardless of how much coal use is growing. Now, of course, I'm not saying that the red and green curves in the graph above are how things will go quantitatively. No question there will be some slowing in the later stages. The need to integrate renewables and electricity-using technology into all aspects of life is bound to slow things down toward the end. Ditto the need to integrate renewables planet-wide to cope with their intermittency. So maybe it takes us to mid-century to get to a near carbon-neutral society. The point is that it's not hopeless. As the weather gets worse - the droughts, the storms, the melting ice - the denialists will look sillier and sillier and the pressure for action will rise. And as it does, the solutions will increasingly be in place. So don't be discouraged if electric car sales are tiny right now, or solar power is a very small fraction of total energy use. This is a long game. Also worth noting is that it's in a couple of decades, as the alternatives truly start to reach scale, that it will be the time to really focus on closing down all the coal mines and shutting in the oil wells. That will be the time for hefty carbon taxes and punitive cap-and-trade regulations. Right now, the focus should be on protecting and growing the ecotechnic acorn. * Wonky footnote - yes, I know I'm comparing renewable capacity to energy use without accounting for the capacity factor. But it's also true that electricity is much more useful than primary fossil fuel energy - for example it can be utilized with 3X higher efficiency in a motor, or power a heat pump with a coefficient of performance of 3X or 5X. So let's just call it a wash for the purposes of a quick illustration of the general idea. b) The consequences of climate change, peak oil, and many of the other factors you often write about seem like they might economically affect those solar/wind trend lines at least somewhat. c) The infrastructure needed to electrify transportation seems like it's a step function up from what we have now (i.e. not evolutionary), and is wholly unrelated to solar/wind electricity being put on the grid. I'm not saying it can't/won't happen, but even if we get there we'll be looking at ~3C of warming or maybe more, and possibly a very different global economic system. Does it stay competitively cheap at the higher volumes? I'm thinking about raw materials; "rare" earths for alternator magnets, copper for coils, and whatever goes into solar cells. Oil may get expensive, but coal (lacking a carbon tax) stays relatively low-cost as a competitor. I have been trying to say the same thing: we CAN do it if we really want to. We can solve the problems of pollution and depletion if we just are willing of making some modest sacrifices. But there is a rubber wall that prevents people from seeing the way out: it is just there; we only have to walk in that direction. But, no - we are stuck to the old ways. It is like the story of the dog who was tortured by electric shocks. Right now I can't find the reference, but there is this story about an experiment where the dog had been suffering so much that he had stopped trying to move. And yet, he was just a few streps away from freedom. Certainly a hopeful post and I've published similarly non-doomster posts as well. But, as I am reasonably sure Dr. Bardi would agree, ultimately (and sooner than is commonly acknowledged) growth must cease. A couple of the most compelling illustrations of this are at the blog site of a physics professor at UC San Diego entitled "Do the Math." I suggest here and here to start. Of course, KoR. The problem here is not growth; it is survival! Hopefully, the energy production from clean sources will increase a lot. I'm sure of it. And I'm also sure that we'll limit our consumption of energy or at least its increase. But there are quite physical limits. For example what's the area of land (and we are going to need a lot of arable land in the future) that is necessary to back that production of solar power. Maybe it's very few, but I don't know. I think that a good and easy to follow report (and I hope that mainly right) is "Sustainable energy without the hot air". It is about how a country like UK may try to extract the maximum quantity of sustainable energy from its environment. We've all seen the big figures about how much energy civilization uses. But is that figure just the raw energy in coal, natural gas, and liquid hydrocarbons we are burning? Leaving out transportation, process heat, and the odd renewable energy included in those figures. Is it the case that our energy needs are roughly a third of the figures listed? Or are those figures "at the point of consumption?" 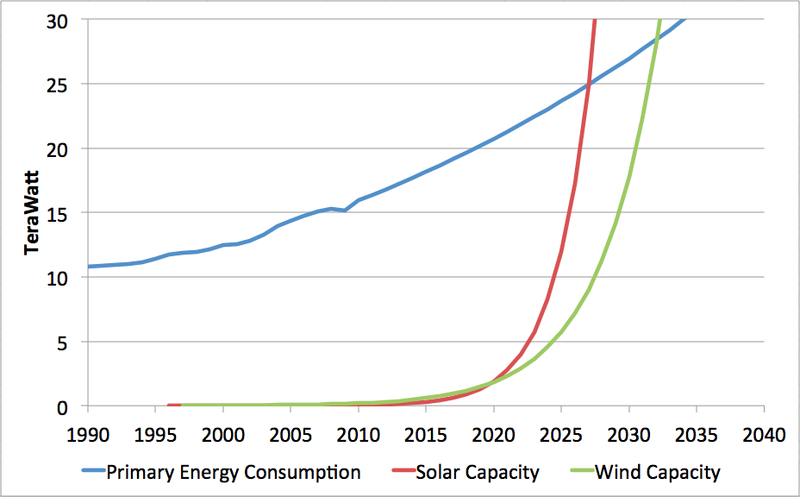 Yes, that line is total primary energy - the raw calorific value of the fossil fuels, plus a bit of nuclear, hydro, etc. My point is that current usage of fossil fuels is (necessarily) inefficient compared to electricity usage in an ecotechnic society. A lot of the fossil fuel is being either burned for heat, or used in an internal combustion engine. In the first case, you have to remember that heat pumps move, ballpark, 3-5 times as much heat as the electricity they use. In the second case, electric motors are 90%+ efficient, versus 20-30% for IC engines. So, in a future ecotechnic society, total primary energy consumption will not really mean the same thing and we might expect it to be 3X smaller to achieve the same results as in the fossil fuel case. But, on the other hand, I'm using BP figures for capacity factor of the renewables, not actual generation, and the latter is probably 3x or 4x smaller. So the two factors cancel (to blog post accuracy, anyway). mjblog - the total land area required to power civilization from solar is quite small - only something on the order of 5% of the world's deserts is required. King of the Road - I would definitely agree with Prof Murphy's contention that we are in the last couple of centuries of growth in energy use on this planet. Assuming the space travel thing continues to not work out, then the best case is we transition to a world in which population and per-capita energy use are stable at levels affording reasonable quality of life, and there is a much smaller level of "qualitative growth". But my focus tends to be on the current century in which those ultimate constraints don't bind, but there are fairly serious downside risks of failing to manage the transition because we are too immature and selfish as a species. on coal will become increasingly strict. Businessmen like to hedge against eventualities - correct? (with the possible exception of a number of Wall St firms who figure that if they run into trouble, they'll be underwritten by Washington). largest size (2 GW) coal plants as any other producer. Note sure I follow you on "and fly around on biofuels". Everyone seems to agree drop-in biofuels are the solution for aviation in the next couple of decades. But how viable are they in a rapidly changing climate? The current drought in the US is exposing the problem. I think in depth analysis would likely show that aviation has a big, big problem. Renewable energy growth is already seeing constraint by the collapse induced by debt saturation. As oil and finance peaks continue, both needed in vast quantity to produce solar technology, those exponential growth curves will never hockey-stick as the spreadsheets show. But one can dream. this post is uncharacteristically superficial. 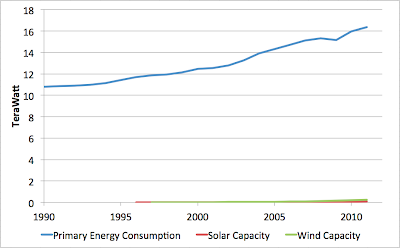 Solar and wind power have high growth rates because they are insignificant. As soon as they get big enough to matter, Liebig's law of the minimum will apply. Take solar. The graph projects that 1 TW of solar power will be installed in 2021. 1 TW of (peak) solar capacity requires approximately 10 billion square metres of tempered glass. According to Asahi Glass's website, the total output of tempered glass in 2007 was about 4.4 billion sq. m., nearly all of it going to automotive use. Asahi predicted (at that time) a growth rate of 2.8% per annum. Can this be increased to 40% per annum? And if it can, can we also scale up aluminium production at the same rate shortly afterwards? 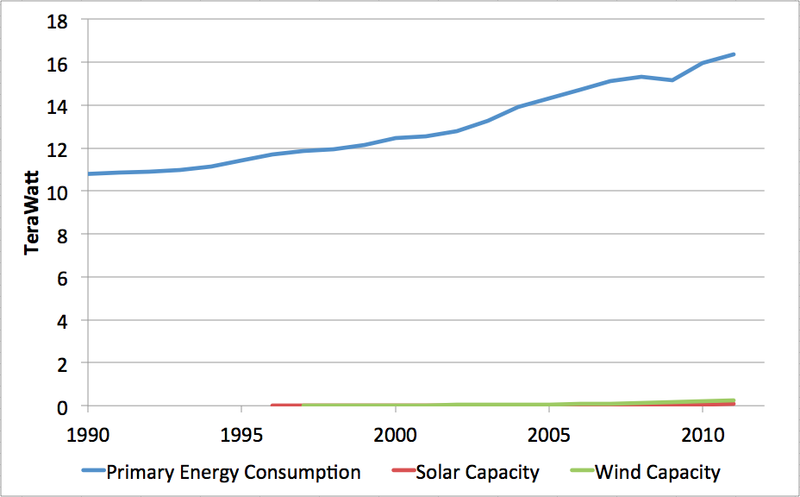 For wind, the total resource just isn't very big - wind is second-order solar energy. And most of it isn't usable, even with Ugo's wonderful flying wind turbines: the wind speed is too low. The specifics don't really matter: at some point fairly soon, solar and wind will use enough of some resource that their rate of growth will be constrained to that of the limiting resource. The conclusion has to be that the growth rates of both solar and wind will slow markedly well before either power source reaches 5 TW average output. Therefore, the long game is much longer than you show it here. We will be using more fossil fuels for longer than the chart implies. Unless... unless we start a crash program of energy efficiency: insulation retrofits, heat recovery retrofits, improved logistics, smart lighting, the whole toolkit. Efficiency is the mustard seed to your acorn - much less visible but no less important. For efficiency to grow and flourish we need high prices for energy, otherwise gains tend to be weakened by the rebound effect. We need carbon taxes *now*, not in a couple of decades. Considering all the other complicating factors - possible near term delevraging of the financial world not least of them - an "ecotechnic" future seems beyond our grasp. Not to say there isn't hope for some kind of future that involves the continuation of humankind, but we should strive to be realistic about what we hope for so that we don't waste limited resources on dead-end efforts. This post kind of reminds me of "modern cities are hard to kill"... Long on speculation but likely not very realistic when set into the complex context of the "real world". "We need carbon taxes *now*, not in a couple of decades." But we aren't going to get them - if the events of the last decade have demonstrated anything, it's that serious carbon penalties are completely politically infeasible. So then what do we do? Nothing? No - we strive to do more of the things that have proven politically feasible - incentives to grow renewable sources and promoting efficiency measures (I'm completely with you on the importance of the latter). The point is that it's only *after* alternatives are scaling toward the point that it's feasible to transition the middle class to carbon neutrality without major pain will it become politically feasible to impose serious restraints on carbon. Of course I agree growth will slow down - I put that caveat in the post already. More specifics will have to await future posts. In regards to what Greg said. Germany recently got 50% or close to it of their energy usage from renewables on a single day. Granted, I believe it was a weekend, but it is still notable. I can't tell you the wind/solar breakdown of that, and probably there was a little spin on the report. But it is still very impressive. Germany for example is nowhere near as good as a province for using solar as the American Southwest. Right now, the intermittency issue is the big thing I think. Nighttime, cloudy days, rain, variable wind, etc. Just saying it is still pretty early, even for Germany as regards this. Someone can correct me if I'm wrong, but I think the transmission problem is now "fixed." It might take some investment, but I think we could use wind energy from the great plains all over CONUS if we wanted. HVDC is good enough, with a bit of shell gaming with loads. And we are now putting superconducting transmission lines into use, which surprised me somewhat. Energy storage is the big deal in my opinion. We basically aren't very good at this, whether large scale or small scale. If nature gives us some water, and a convenient elevation, that is about as good as we can do. From my viewpoint, any research involved with energy storage, or batteries in particular, needs to get a green light if it is reasonable. Same with funding manufacturing initiatives with such things. I also want to point out that when we use electrical energy we often transform it from AC to DC, which is at a loss (at 75% to 96% efficiency). People are already working on the DC issue. Also something I hadn't though of, the inverters solar panels use to turn DC to AC have losses. Then your transformer has losses from AC to DC. Still a lot of minor issues with this, like standards. The big issues is the installed base, and manufacturing base of products that use electricity. Technically I don't think it is much of an issue. It could be done if we wanted. Greg: is tempered glass required? Why not acrylic? It's lighter, safer, more resistant to shattering, though it does need a UV protective coat. Depending on where the panels are installed (and how they are cleaned), a very thin sheet might suffice. And whatever we do on the scale of our national energy consumption, it's going to be big, and engineered to a fare-the-well. Ultimate efficiency might take a backseat to up-front capital costs. I'm amused at the idea of a windshield shortage, if solar ramps up anywhere near that much. While we cannot argue with the need for alternative sources of energy, let's not lose sight of the fact that 'alternative energy' arrives mostly in the form of electricity. You can do lots of useful things with electrical energy. Electricity needs above all else, insulation. Strip away the (oil based) insulation from electrical wiring, and we're all back in the dark ages. Literally. Extrapolate that to almost every object that civilised man has come to rely on for his very existence, and then see why 'alternatives' aren't going to do much for us. Look around you, then mentally strip away everything that has a coal oil or gas input embedded within it. You'll be sitting on bare earth, naked and starving to death. That is our oil dependency in stark reality. I take it to be axiomatic that civilization is drawing to a close. Axiom 1: A very tight band of global temperature fluctuation is necessary for the intensive production of rice, wheat and corn. This is why anatomically modern humans colonized the planet but didn't produce staple crops in sufficient quantities to produce the surfeit population numbers necessary to support complex civilizations. Over the past 400,000 years temperature and CO2 have been highly correlated and stable periods like the Holocene epoch are exceptional. Given the acceptance of those two axioms, the likelihood that the current hockey-stick rise of CO2 will sufficiently disrupt the stability band of the Holocene seems very high indeed. It's easy to think if we just reduce the ppm of CO2 then we'll somehow revert back to a Holocene temperature regime. But the Holocene is no mere abstract temperature regime - it's a truly unique historical accident of unparalleled global environmental stability (which allowed for agriculture). We're getting kicked out of the Holocene. There's no going back - the stability that the Holocene has exhibited won't be resurrected even if we return the atmosphere to sub-350 ppm of CO2. The days of agriculture and complex civilizations are over. You know, Aaron, sometimes I find someone who is more catastrophist than me and it is always a shock. But you said it well. Ugo, I entirely agree that no one should just stand and watch. But I often find myself wondering at the response to climate change. The discussion seems to focus on how to maintain the trappings of civilization via a method of energy production that doesn't disrupt the climate. Little to no attention is directed to the sole trapping of civilization that matters - a method of food production that allows for greater numbers of people to exist on smaller areas of land, i.e., sedentary intensive agriculture. When do you read blog posts demanding an increase in global grain stockpiles to get us through the inevitable downturns in harvests? How many articles hopefully address technology that would allow novel ways of feeding people such as growing algae or synthesizing food? How many proposals regarding novel changes to diet such as insects or earthworms? We're staring into an abyss of mass starvation that typically renders the glue of social cohesion into a thousand tattered shreds.... and we continue to discuss the impacts of rising sea levels on coastal infrastructure and whether we can commute to work in an electric vehicle. Your response to my catastrophism wasn't "No-one can prove that synthesized protein and insectivorous diets will save us, but no one can prove that they won't, either" - instead you expressed a very typical hope that we can maintain our lifestyles without a large carbon footprint through the use of renewable energy. Certainly commendable but, in my opinion, misplaced. Time is short and the risks are high. Our memories are too short - 10,000 years of agriculture does not mean it's sustainable - it's just a brief ten millenia experiment. Whatever comes, we need to prepare which means mitigating severe drops in projected staple crop harvests. Perhaps this summer's drought in the US will get the conversation started. Aaron, on the whole I agree with you, but, excuse me, you are "stretching" a bit my comment. I wouldn't even dream to say that there are nice technofixes to the lack of food that we'll experience when kicked out of the Holocene. No way. The point is to avoid being kicked out of the Holocene - I agree that ie may be too late; but we don't really know. So, if we still have a dim hope of maintaining the Earth's climate more or less what it used to be during the past 10,000 years, it is not enough to stop burning fossil fuels - even if we could. We need energy to manage the climate system; if nothing else, just to observe and model the system. I am not a big fan of geoengineering but I do think that we can pump back a lot of CO2 from the atmosphere - and for that we need energy. So, I think we should go for more than one line. Treaties, adaptation AND renewable energy. Can we do it? In principle, yes, the problem is not the technology, it is the human mind. When I have a moment, I'll try to make a post on my blog on the concept of "being kicked out of the Holocene"
" the total land area required to power civilization from solar is quite small - only something on the order of 5% of the world's deserts is required." Hi There, I would like to answer to spanof. The actual surface required to produce a certain amount of kWh depends on the latitude at which panels are installed. Just check on google the word PVGIS and you will find reputable databases which will help you on your calculation. I would like though raise up an ENORMOUS aspect related to this kind of renewable energy. The opportunity for everyone to produce his own. What OIL cartel is fighting is NOT the fact that there are alternative to OIL (think at Nuclear for instance) but the fact that with Solar and Wind everybody can produce his own energy without submitting to other's will. Furthermore, by implementing a distributed network were everyone produces his own energy, you get a more stable and resilient solution, and smaller problems for transporting energy across the globe, using other energy.